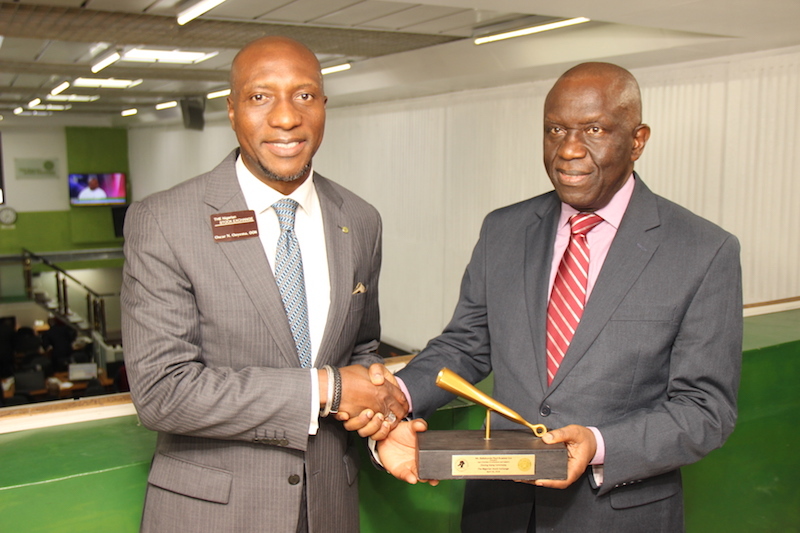 L–R: Oscar N. Onyema, chief executive officer, The Nigerian Stock Exchange (NSE) presenting a replica of the closing gong to Babatunde Ruwase, president, Lagos Chamber of Commerce & Industry (LCCI) during the closing gong ceremony in honour of the new president of LCCI at The Exchange in Lagos on 30 April, 2018. April was a bearish investment month at the equities segment of the Nigerian Stock Exchange (NSE). Although the equities market on Monday began the first day of trading for the week on a positive note. The performance indicator at the NSE, the All Share Index (ASI), gained 0.06 percent to close the day at 41,268.01 points as against a 1.15 percent growth recorded last Friday. Being the last trading day in the month of April, the consolidated gains for the month were not enough to yield a positive return as month-to-date (m-t-d) yields closed -0.57 percent while year to date returns appreciated to 7.91 percent. However, market observers and analysts expect a sustenance of recent gains into the coming trading days, provided first quarter results of listed companies show positive performances. Monday’s growth performance was impacted by gains in the Industrial and Banking Indices. The industrial index gained 0.56 percent on the back drop of a 0.41 percent or N1 growth in the share price of Dangote Cement. The Banking index similarly increased 0.43 percent as Guaranty Trust Bank, Zenith Bank, FBN Holdings gained 1.47 percent, 0.18 percent, 0.40 percent respectively. Investors gained N8.4bn as Market capitalisation which closed at N14.949 trillion increased from previous session’s N14.940 trillion. The day’s top three gainers were CILEASING, HMARKINS and BETAGLAS, increasing 9.35, 6.25 and 4.97 percent to close at N1.52, 34 kobo and N79.25 per share respectively. On the other hand, REGALINS (-10.00 per cent), DANGFLOUR (-5.00 per cent) and ETERNA (-5.00 per cent) emerged the day’s top three losers, to close at 27 kobo, N13.30 and N6.27 per share respectively. Meanwhile, volume and value of trades traded on Monday grew 41 percent and 78 per cent. Investors exchanged in 4,699 deals a total of 450.5 million units worth N4.959 billion. Topping the list of most traded stocks was Mutual Benefits that sold 131 million units of shares worth N31.4 million followed by UBA that traded 67.8 million shares valued at N781.1 million, FBNHoldings that exchanged 53.6 million shares amounting to N670.3 million, Zenith Bank that transacted 23.6 million shares at N648.5 million and Transcrop that sold 16.1 million shares worth N27 million. Market analysts anticipate Monday’s positive performance would be sustained in subsequent sessions after the May 1 workers holiday as investors are likely to take positions in growth stocks, which will buoy market performance.